Partly cloudy skies. Low 41F. Winds WNW at 10 to 15 mph.. Partly cloudy skies. Low 41F. Winds WNW at 10 to 15 mph. Brittney Hall takes George, aka Guh, the wonderdog, out for a walk in downtown Monmouth. MONMOUTH — Brittney Hall never aspired to be a published author. The Monmouth resident keeps herself busy as an event planner, bookkeeper for Marr Bros., and a mother of two. But when she and her family bought an English shepherd puppy, Hall thought someone had to tell a story about this breed, unrecognized by the American Kennel Club. At first, she thought about finding someone else to tell the story. 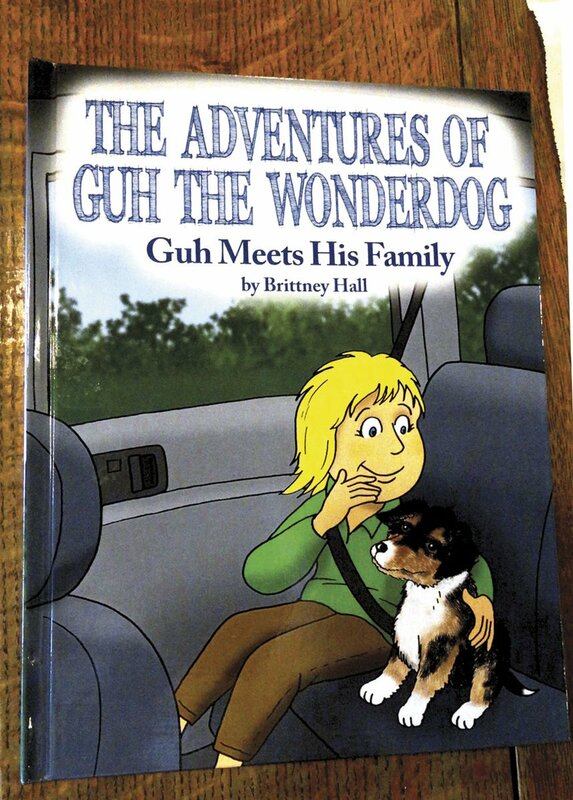 So she sat down and wrote the story of George, “The Adventures of Guh the Wonderdog,” published by Dorrance Publishing Co. Inc. The Halls bought George, affectionately called, “Guh,” when Brittney’s daughter was just 1. Guh would wake up early and be ready for his morning nap just as Hall’s daughter was ready for breakfast. She found it ironic that her baby finally slept through the night, and the puppy was not letting her get much shuteye. Guh thinks he is part of the family, and insists on sitting on the couch while watching TV, or sleeping on the bed — in spite of his 70-pound size. The breed is of a collie lineage, Hall said, and is a herding dog. Though Guh is not pleased when everyone is scattered around the house, Hall said. Hall’s daughter — and now son, too — are Guh’s favorite buddies. “In the book, it talks about the mom being not so sure about this dog, but this little girl adores him, and they’re playmates, and he always wants to be with the family,” Hall said. She wrote the book with bedtime in mind. Hall wrote two books, starting with a more current version of Guh, but realized that she needed to write an introduction to the characters first. The second installment of the adventures of Guh will be published later. For now, Hall is focused on the success of the first. She said she has learned a lot getting a book published. The book is available on Amazon in hardcover and electronically. Also, Hall will participate in storytime at Independence Public Library at 10:30 a.m. on April 5.